It’s Tuesday, you guys, and you know what that means: TACO TUESDAY! 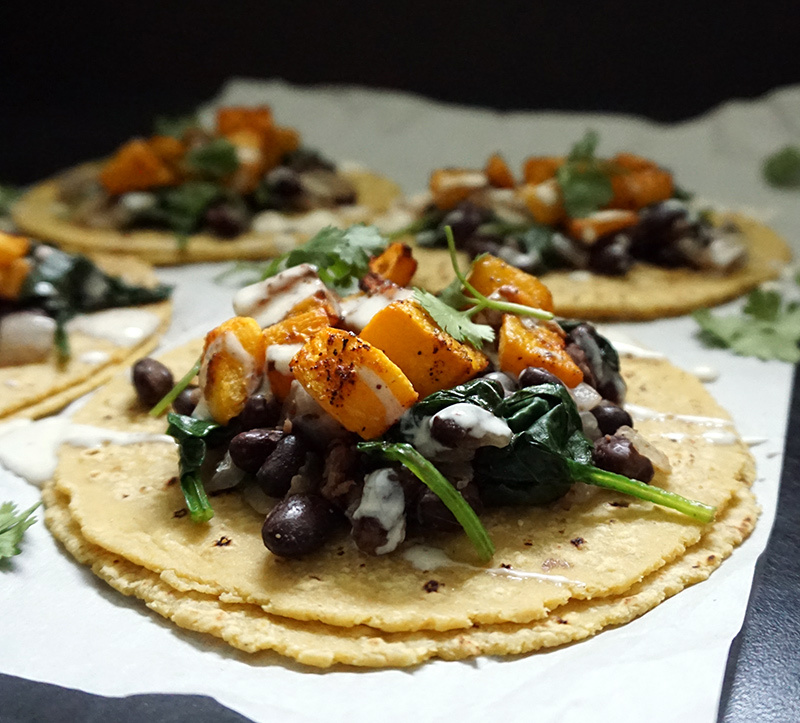 This particular iteration of said tacos are sort of fall-inspired using roasted butternut squash and black beans. 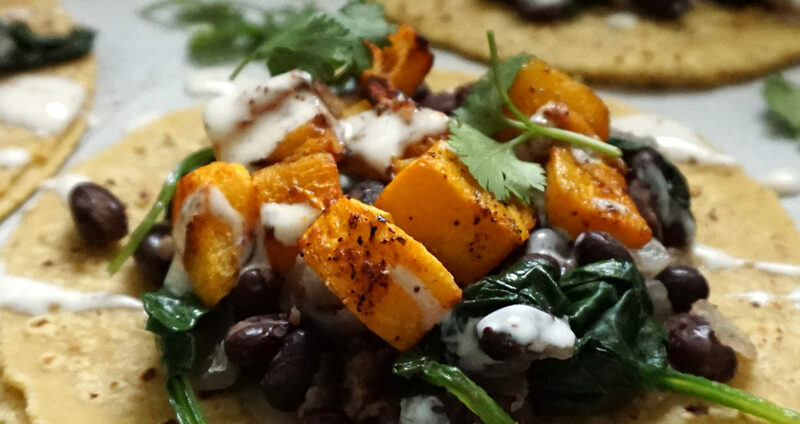 Plus, I’m making it Meatless Monday-friendly by making it vegan, too. 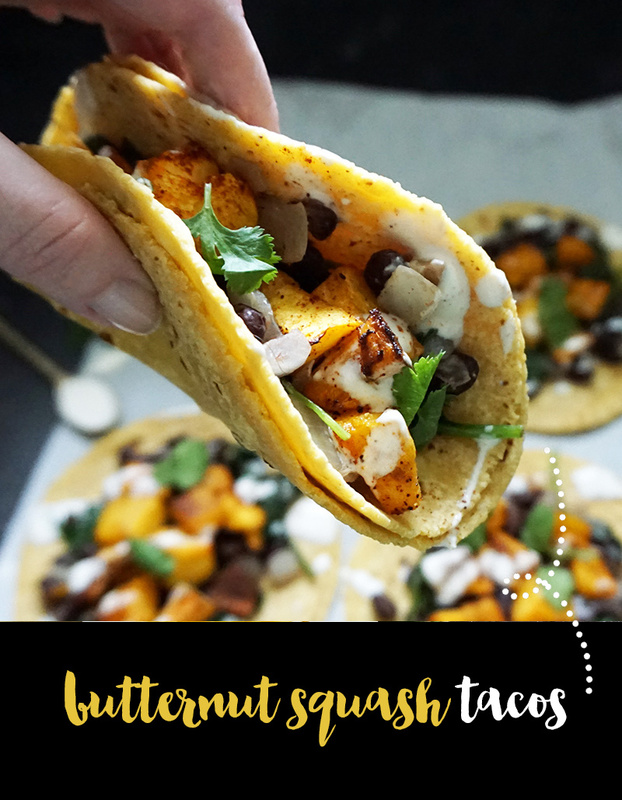 Are you ready for these vegan butternut squash tacos with a homemade maple tahini dressing?! I know I am. I’m going to be moving next month to a new city. I’m super excited about it, but I’ll be moving away from one of my favorite tacos joints. While I’m sure there are many killer tacos in my future in the new town, there’s something about that weekly familiar taco that just feels so good. 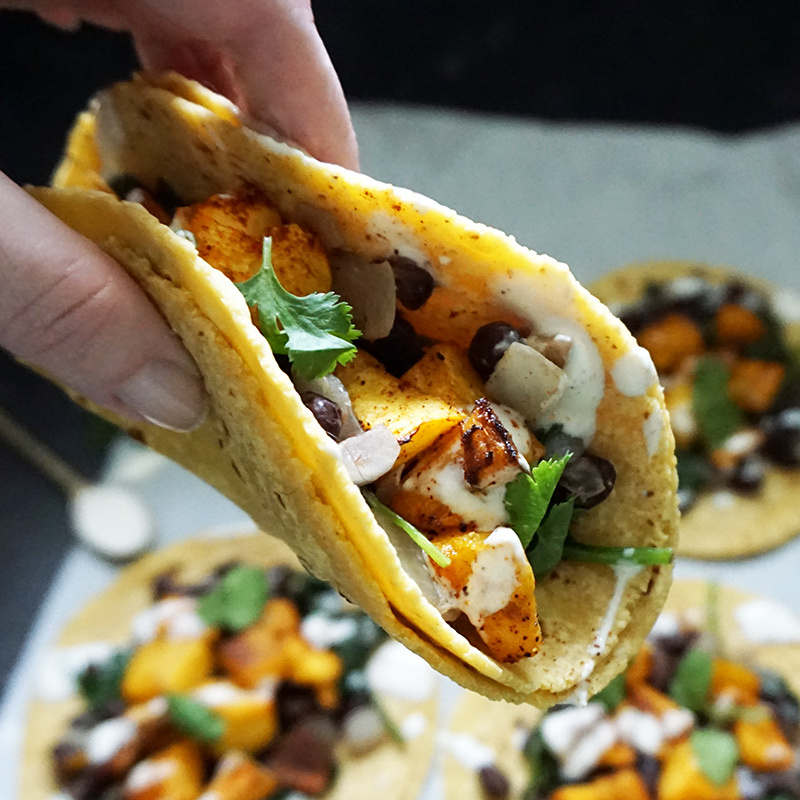 Thankfully, tacos are dead easy to make, so I can always re-create my faves as needed. 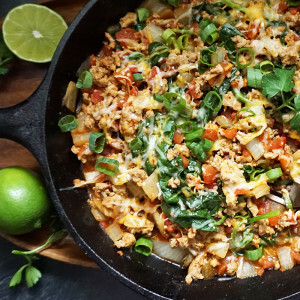 I think this one, with its easy and cheap ingredients, will be a winner for you, too. 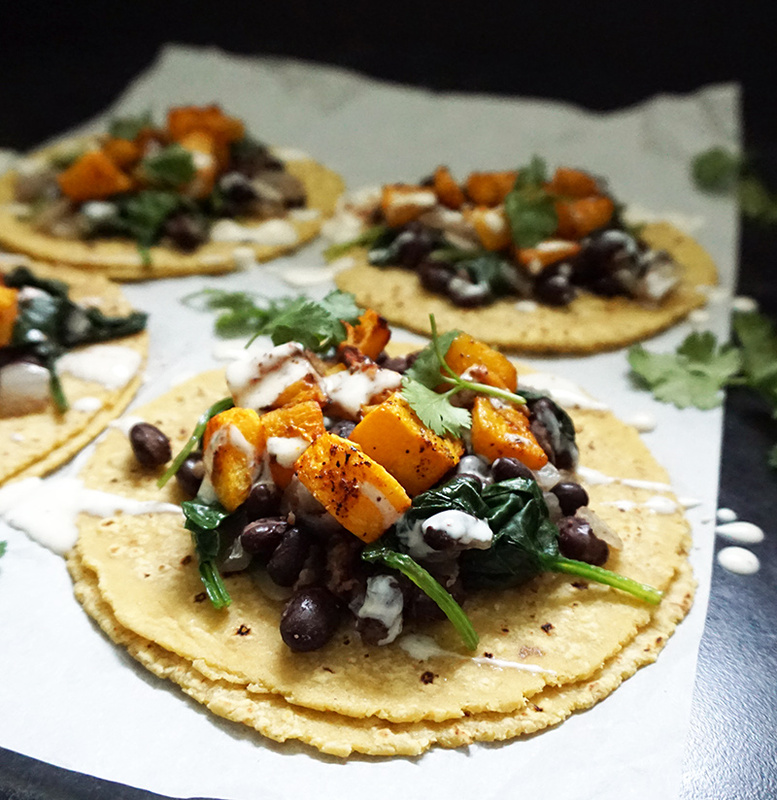 I used a yellow corn tortilla for these, as you can probably see from the color. My favorite brands are from Trader Joe’s and these from La Tortilla Factory. Feel free to use any kind you prefer: corn, flour, big, small. I actually never knew why some joints double up on the tortillas until I looked it up. It makes perfect sense, actually! 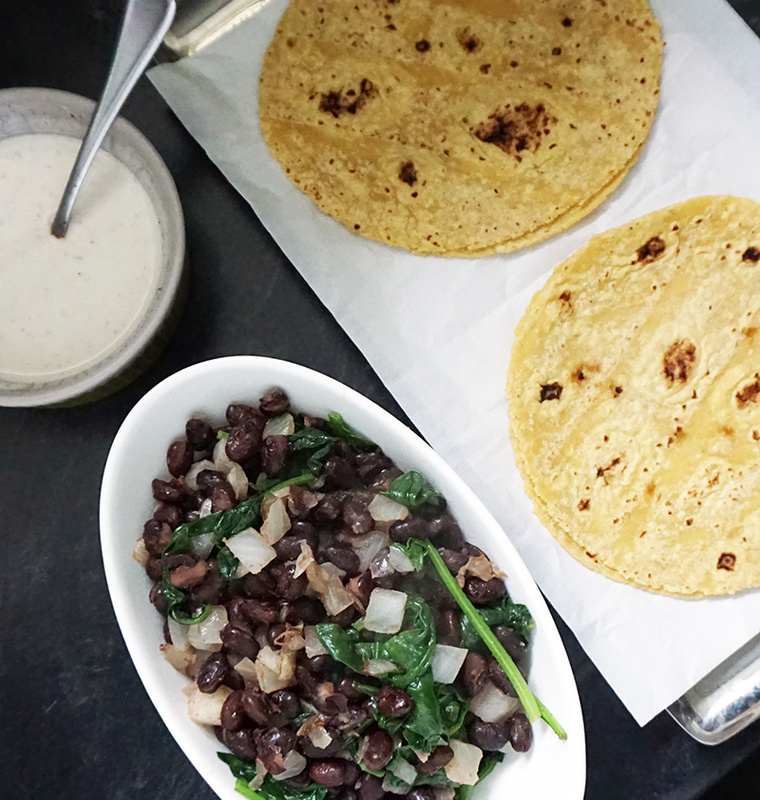 Since tortillas are usually pretty thin, and restaurants often bulk up on the fillings, you end up breaking one tortilla and the other serves as a back-up. AND if you drop some fillings (because you didn’t tilt your head enough! ), you can just make another bonus taco. Aw yeah. 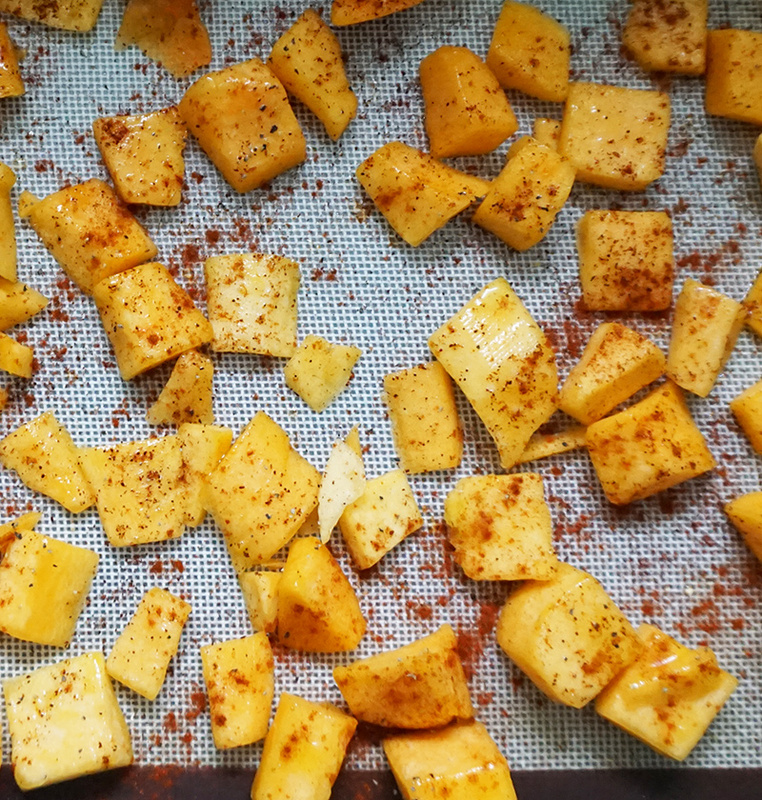 Layer butternut squash cubes onto a baking sheet lined with parchment. Brush cubes with olive oil and maple syrup. Sprinkle with cumin, chili powder, paprika, salt, and pepper. Bake for 25-35 minutes or until tender and just starting to brown at the edges. Turn once during cooking to brown all sides. Remove from the oven and set aside. 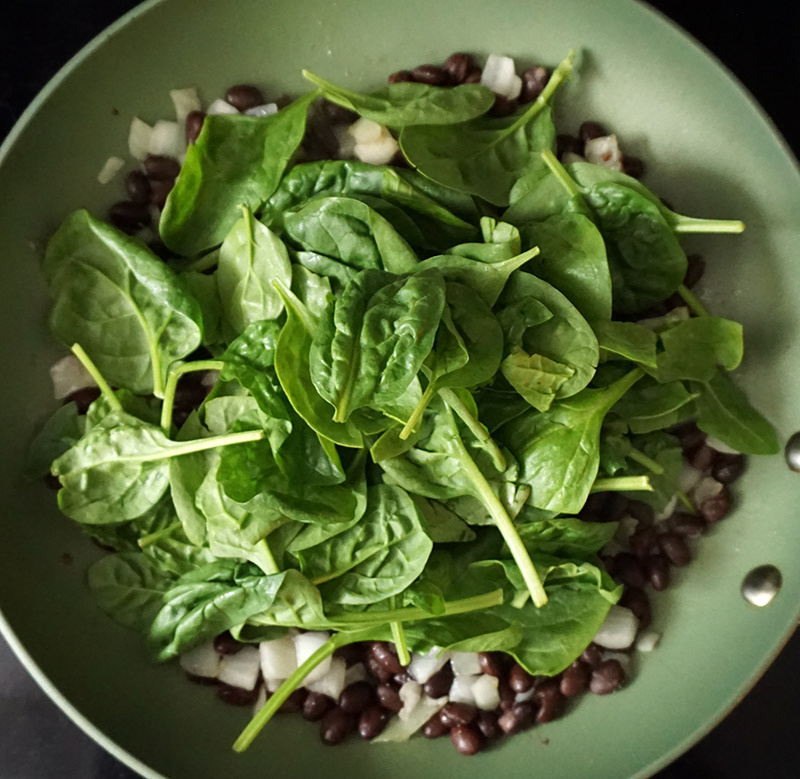 While the squash is baking, prepare the beans, spinach, and onion mixture. Over low heat, add the beans to a small pan with the garlic powder,chopped onions, 1 tsp olive oil, and a pinch of salt. Stir for 2-4 minutes to heat through. Add in about three large handfuls of fresh spinach and let it wilt for about 3-5 minutes, stirring often. Prepare the maple tahini sauce by adding tahini, maple syrup, and lemon juice to a mixing bowl and whisking to combine. Add hot water until a pourable sauce is formed. Set aside. 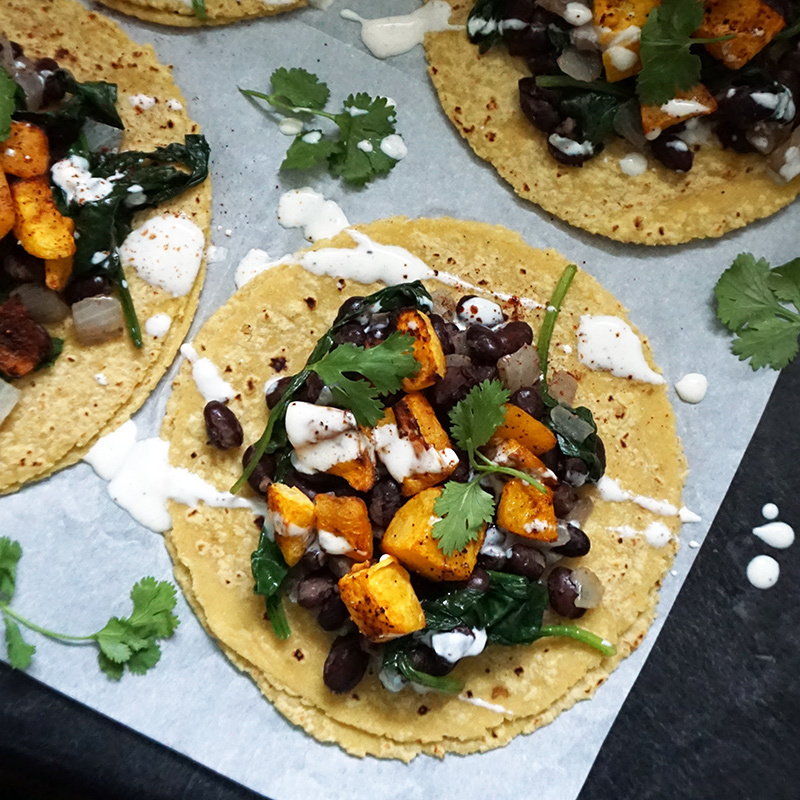 Prepare the tacos by topping the corn tortillas with a spoonful of the bean and spinach mixture, then a spoonful of the butternut squash. Garnish with chopped cilantro and maple tahini sauce. You must have the most incredible lighting. Your photos are always amazing. And a side note on squash. I learned this weekend that everything that is pumpkin-flavored, is actually squash-flavored. Squash has a better texture and is sweeter than pumpkin, so food manufacturers use squash, and just call it pumpkin. The FDA has loose guidelines on what defines a gourd. And yes! I too just read that somewhere. I love both, though, so I’ll take any and all.